The Vessels Club at Los Alamitos Race Course is the elegant new home for live afternoon Thoroughbred racing in Orange County. With its plush interior, exceptional cuisine and choice finish line location, The Vessels Club delivers one of the finest upscale facilities to experience California horse racing. Located on the second level of the grandstand building, The Vessels Club is named in honor of the founding family of Los Alamitos Race Course. The lower level lounge of The Vessels Club is highlighted by our handcrafted horseshoe bar which dominates the center of the room. 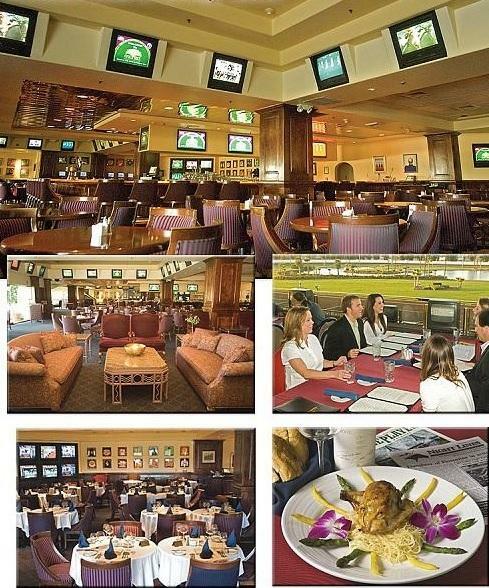 The lounge is a perfect place to dine, socialize and enjoy the races in relaxed comfort. Stepping out towards the finish line, guests will find our expansive outside patio dining area, which offers an unsurpassed view of the action. This elegant outdoor setting promises to be a popular spot, as it overlooks our brand new expanded winner’s circle area. With an amazing view of the Orange County skyline, the Grand View Terrace is an ideal spot for hosting a company party, a night at the races, or for celebrating any special occasion. The upper level of The Vessels Club is home to our glass-enclosed terraced dining room featuring television screens on every table and an easy to access self-service wagering terminals. The Vessels Club gourmet menu features entrees ranging from filet mignon, to grilled wild salmon, and to fresh pasta dishes with a wide array of desserts. Guests may choose from a menu of carefully selected wines. There is ample room throughout The Vessels Club, but it is recommended that you call for reservations for an outdoor patio or terrace table. For vessels Club reservations call our Maître ‘D at 714-820-2681. For parties of 30 or more call 714-820-2674.